Bond yields have been moving up and some investors see these higher interest rates as a threat to the stock market. Our analysis suggests we are some way from this being the case, but much closer to it in the US than in the UK. Government bond yields are rising around the world as the combination of synchronised global growth, higher policy rates and the beginning of “quantitative tightening” in the United States allow some progress toward more “normal” interest rates. This process is most advanced in the US where rates across the yield curve have moved up significantly, particularly in the last six months. Rising rates are a challenge to investors in bonds and we remain of the view that government bonds are unattractive as we expect the process of normalisation to continue. However, a lot of comment has focused on the role that rising interest rates are having in making the stock market more volatile in recent weeks. Some have pointed to charts such as the one below indicating that US interest rates are at levels we have not seen for a decade. 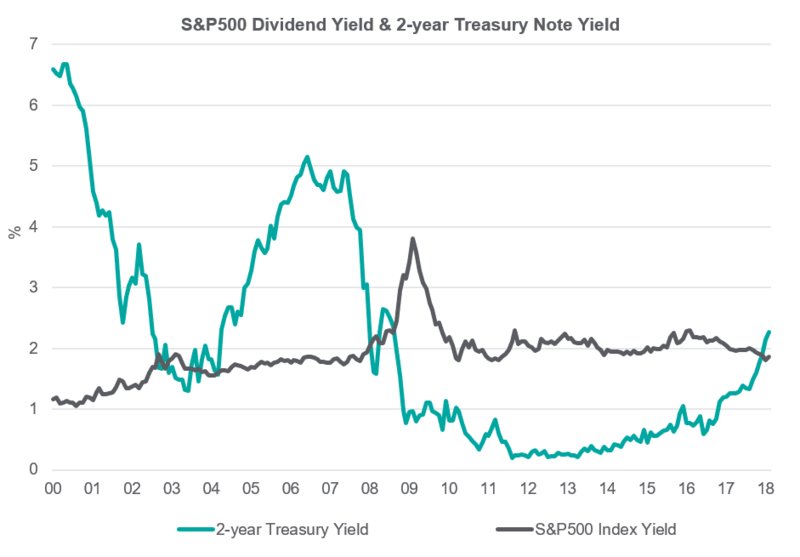 The yield on a two-year US Treasury note is now above the dividend yield on the S&P500 benchmark equity index, for example. For investors focused on the income they receive from their equity investments, the above chart is worth being aware of. But comparing a short duration note with the yield on the equity market is comparing apples with oranges. What matters more is if longer-duration yields get to levels that make them attractive relative to the return expected on the equity market. One way to consider this is to calculate the Equity Risk Premium (ERP) where we look at the relative attraction of the equity market to the bond market by calculating the additional return that the equity market is offering for taking the presumed greater risk of investing in equities. The New York Federal Reserve wrote a paper in 2015 reviewing 20 different ways of calculating the ERP (click here to read). That this quantitative tool can be calculated so many ways is a reminder that investing is as much an art as a science. But it can help us to draw some conclusions that are worth knowing. In the period since the great financial crisis and recession of 2008-09 the ERP has tended to be quite high, as the New York Fed paper makes clear, thanks primarily to the extraordinarily low level of interest rates on offer from bonds. So one very important question today is whether the rise in bond yields recently has made the bond market more attractive relative to the equity market? The answer to that question is yes, to some extent it has in the US. We have calculated the ERP here as the current dividend yield on the equity market (S&P500 or FTSE All Share), plus the assumed growth rate in those dividends (4% in the UK, 4.25% in the US), minus the current bond (gilt) yield. For the US that works out at as an ERP of 3.3% at the end of February. As the chart below shows, this is meaningfully lower than it has been recently and is simply a reflection of the stronger US stock market coupled with the increase in bond yields. The latter have doubled since June 2016. The above chart suggests to us that, all other things being equal, if the US 10-year Treasury yield were to reach 3.5% from its current 2.9%, the ERP would return to its 2003-2007 level. At that point it may be that US domestic investors feel that there is more balance in the relative attraction of bonds and equities than we have seen since before the 2008 crash. Until then, the US stock market still looks attractive relative to the bond market. Here in the UK the picture looks a little different. Our UK ERP remains very elevated thanks to the persistence of very low gilt yields. Hence the chart below suggests that, again, all other things being equal, gilt yields would have to be 5% rather than the current 1.5% for the UK ERP to be at the level it trended around prior to 2008. 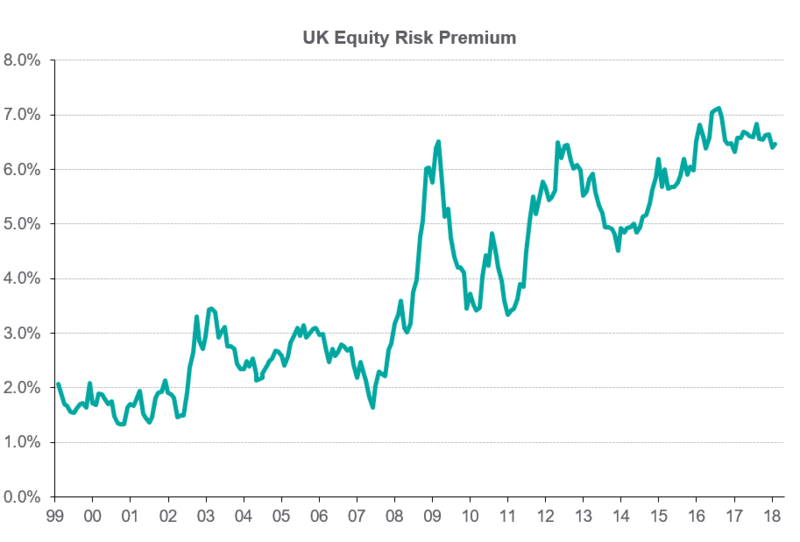 The UK stock market remains much more attractive than the gilt market (although not necessarily relative to other equity markets) and is likely to carry on being so for quite a long time. Of course markets do not behave as models suggest they should so there are many factors that will determine the impact of interest rates on the stock market. For example, a significant drop in interest rates, because of fears about growth for example, would make equities look more attractive in these charts. However, those fears about growth could prompt a sell-off in equities if investors became fearful that earnings will not come through as expected. But what these charts do remind us is that the increase in interest rates we have seen in recent months has not been enough to make bonds look attractive relative to equities. 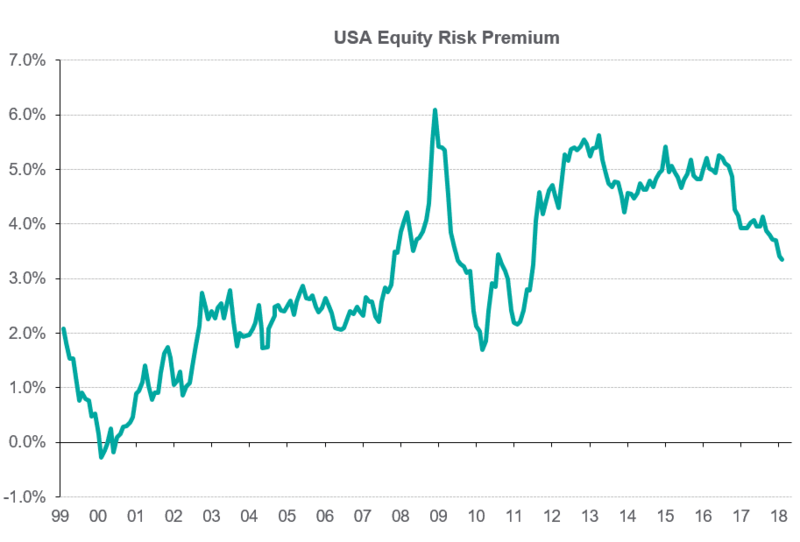 Despite its drawbacks, the equity risk premium suggests that equities are likely to outperform bonds in the months ahead.